I’m struck by how many sacrifices people offered to God in the Old Testament. It wasn’t just the sin offerings and blood sacrifices we know pointed to Christ. There were also burnt offerings, grain offerings, and peace offerings given for thanks or as part of a vow, or voluntarily in worship and devotion to God (Lev. 1:1-3:17; 6:14-23; 7:11-36). The book of Hebrews makes it very clear that Jesus fully filled all the offerings for sin, trespass, and atonement. This High Priest “does not need daily, as those high priests, to offer up sacrifices, first for His own sins and then for the people’s, for this He did once for all when He offered up Himself” (Heb. 7:27). But how are the other offerings fulfilled today? I think most churches encourage monetary offerings and/or tithing, even if they don’t use those exact words. That’s not the only thing we have to offer though. In fact, it’s not even the primary sacrifice God expects from His people today. We’re to follow Jesus Christ’s example in all things, including offering ourselves. We won’t be the same type of sacrifice nor operate at nearly the same level, but in the most general sense that is what we’re expected to do. God has everything He could ever need, yet He wants us. We are a sacrifice that we offer to God with nothing held back as we fulfill the first commandment: “You shall love the Lord your God with all your heart, with all your soul, and with all your mind” (Matt. 22:37). In the Old Testament, there were rules about the quality of your sacrifices. Sacrificing animals with blemishes, illness, or other imperfections was an abomination (Deut. 17:1; Lev. 22:20-25). Your sacrifice had to belong to you and it had to be the best you can offer. Thankfully, God accepts our offerings of ourselves no matter how broken and imperfect we are in body or spirit. But He doesn’t intend for us to stay damaged and unacceptable on a spiritual level. Part of our reasonable service is to become holy and acceptable to God. We’re to work toward perfection as we grow and are transformed by God’s divine power to be like His Son. Learning to live in the spirit rather than the flesh is a process that will take our whole lives, but it’s one that living sacrifices submit to. Even in the Old Testament, people of God knew the physical aspects of sacrifice and offering weren’t what was most important to their Lord. While the sacrifices were important, they weren’t the point. Much more important was obedience and walking in faith (Jer. 7:21-23). Doing justice and loving mercy is more acceptable to God than physical offerings (Prov. 21:3; Mic. 6:6-8). And even in the Old Testament God sought offerings of praise and prayer made with our mouths (Ps. 27:6; 119:108; 141:2). That carries into the New Testament as well. When we do the things God tells us to, it’s counted as offerings made to Him. Good works, obeying His commands, praising and worshiping Him, fellowship with others — all these sacrifices please God. They’re also the things He has always been seeking. Though we don’t sacrifice as they used to under the Old Covenant, we’re following His will when we offer of ourselves. We can still make physical offerings that glorify God as well. 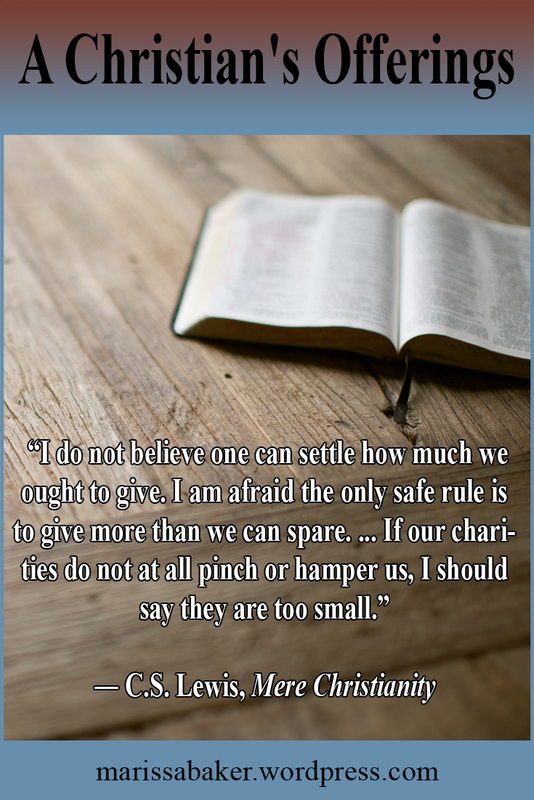 Most churches in my experience still encourage monetary giving, and scriptures indicate donations of food and assistance count just as much (2 Cor. 9:1-7). We’re also told to give cheerfully and as we’re able, rather than by compulsion, but that doesn’t mean we get a free pass if we just don’t feel like giving. We should be very cautions about doing anything that could be described as robbing God. We should give, and we will want to give if our hearts are in the right place. The “how” of giving can be more complicated, since there is neither a priesthood nor a temple where we can bring physical offerings. Some teach that the ministry collects tithes as modern Levites and it’s their job to distribute the money for the work of God. I question that, since Hebrews makes it clear that Christ’s priesthood after the order of Melchisedec completely replaces the Levitical priesthood. Also, the entire church, not just the ministry, is “being built up a spiritual house, a holy priesthood, to offer up spiritual sacrifices acceptable to God through Jesus Christ” (1 Pet. 2:5). There’s certainly nothing wrong with giving to churches, but it’s not the only way to honor God with your giving. You’re responsible for your sacrifices, tithes, and offerings. That includes money, assisting brethren, praise and prayer, and your entire life. 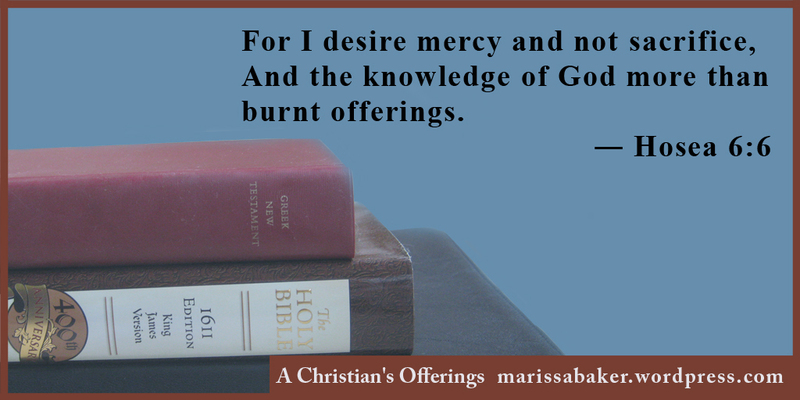 We owe offerings of many types to our great God. He gives us freedom in how we follow these commands, but we must follow them. Let’s give of ourselves and our things in a way that honors our Father and our High Priest Jesus Christ.